From the second football game through to the 3rd quarter of the evening game I sewed down sleeves. I finished three of the four to do. 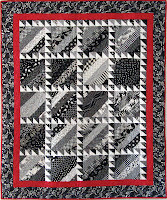 Mom's black and white quilt will be enroute to Maryland tomorrow morning. It was the first to finish. Kerfuffle and Kwiltathon were next. Kerfuffle will be displayed for a time at work with Kwiltathon following next. Knickels will be next to finish. 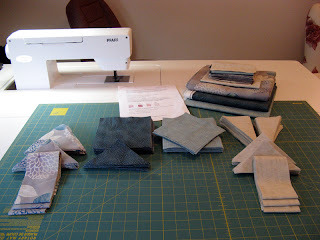 I plan to get some navy fabric tomorrow for my Sister's quilt. 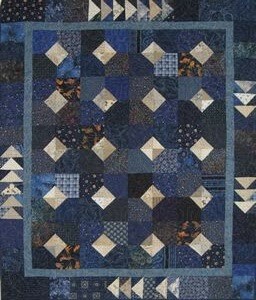 I have several dark blues but none go as well as one that I don't have enough of to get around the quilt. 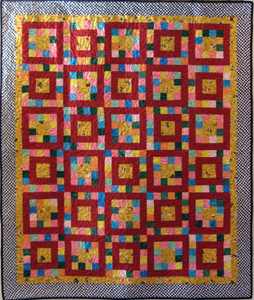 It is a big quilt from a very old top whose maker is not known. My Sister has had it for sometime now and it came to my attention in September during my visit. A back from Rosie's turned out to be perfect. 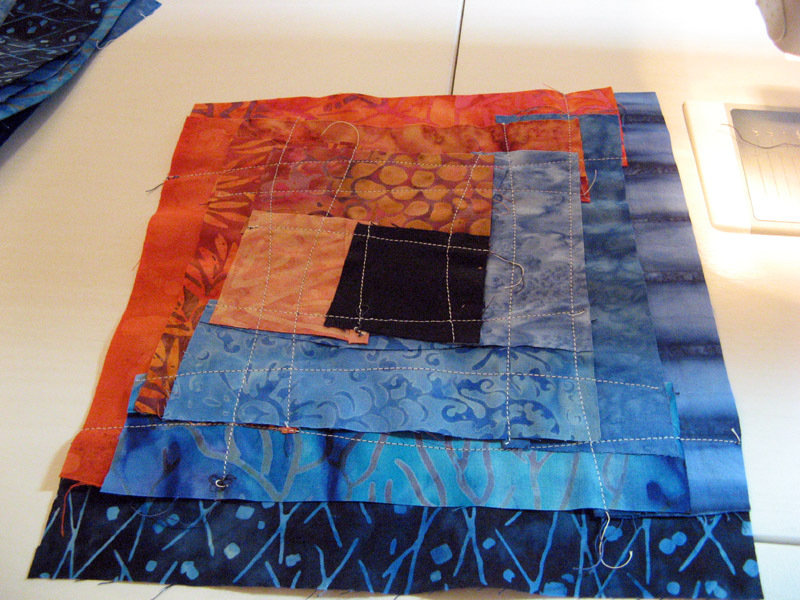 I am very pleased with the quilting. 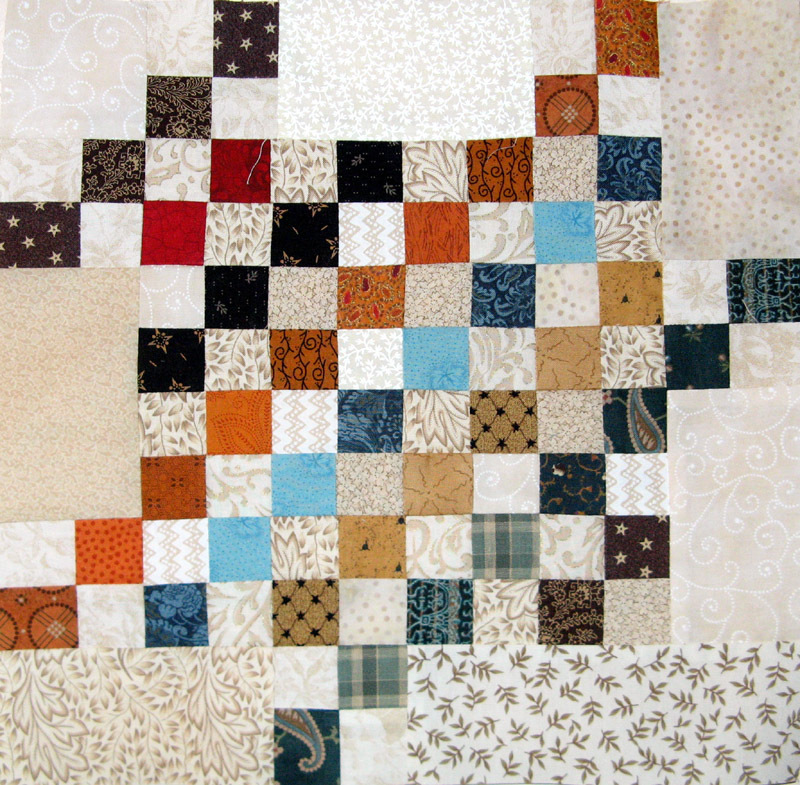 Did you have a quilt to donate to the Sandy Storm relief? I sent Kontinental to New York not too long ago and had confirmation that it made it to the addressee on Friday. I haven't heard lately if the power is restored to all or not at this time. There were still pleas during the football games to send whatever you can. Hope your last week of November is all you want it to be. Don't spend too much on this Cyber Monday! 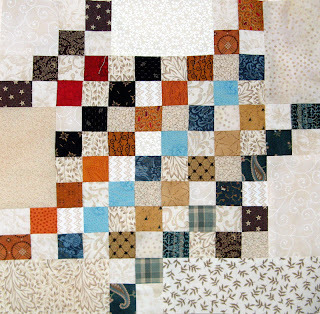 Many others have projects to show through the links of Patchwork Times. Today I'll spend most of my time on Easy Street Part 1. I have made a bunch of twosies already, but I'm certain that I'll need at least as many as I've made more... Going to be a busy day making 4-Patches. Bonnie Hunter's annual mystery will keep me busy for the next several weeks. If you want to join in on the fun go to her website for the parts each week on Friday's. You can find a link to her site on the right side of my page. We had company on Friday and Saturday so little time to sew until today. I gifted DH's brother with Kobalt. I gave him a bunch of quilts to choose from for his birthday. It was a tough decision for him. As soon as he saw Kobalt he knew it was the one he wanted. 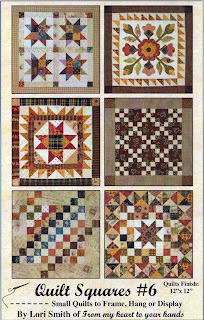 Kobalt is a pattern called Blueberry Pie, from American Patchwork and Quilting June 2007. Happy Birthday Don! I finished putting the binding on Knickels. 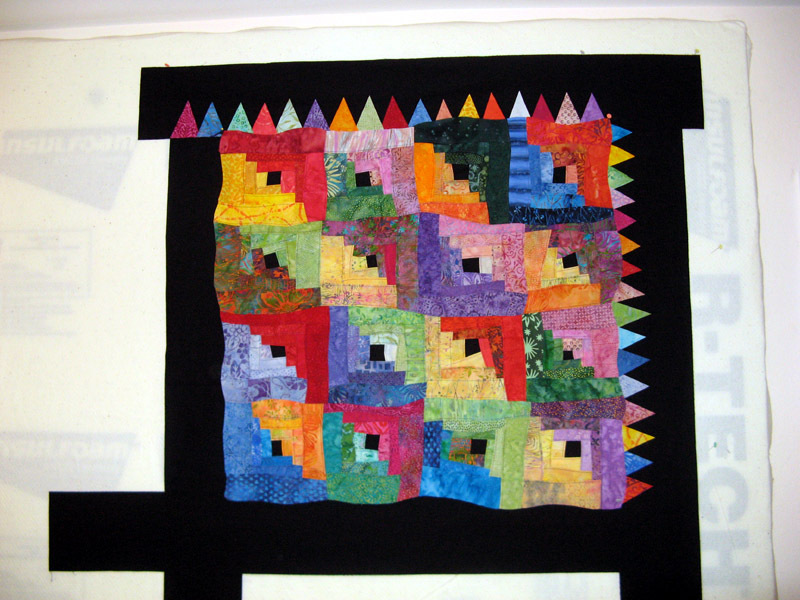 I'm excited with this quilt. 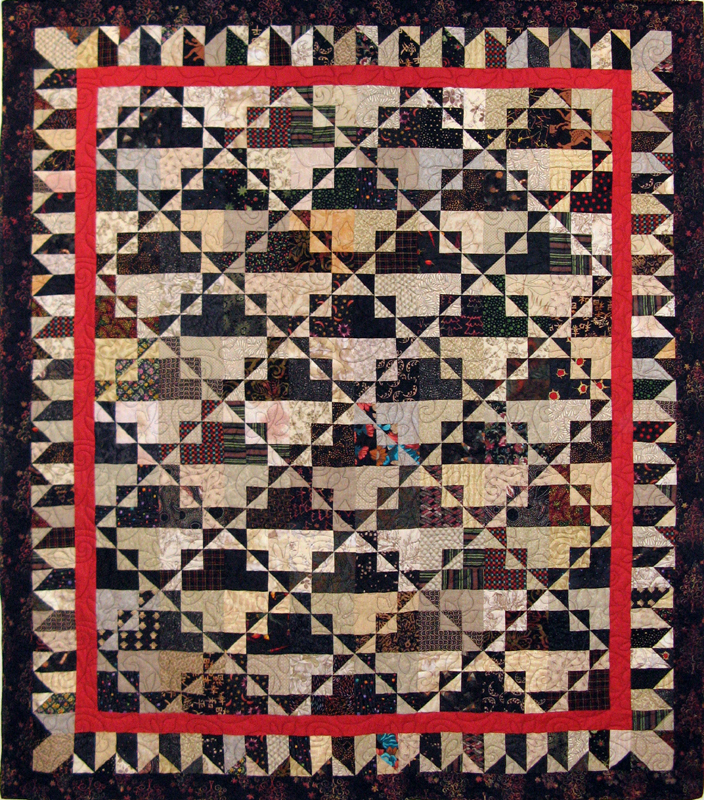 It's one by Pat Speth called Dawn to Dusk from her book More Knickel Quilts. I have a good report this week. Karen's Knines is complete. I'm going to have to get my quilt rack out to take a photo of this quilt. 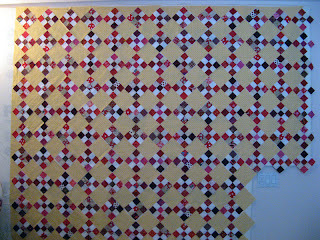 As I have mentioned this quilt is a big one! I did purchase the back fabric so that's the add, but it's off again in part of the 20 yards that it took to make. 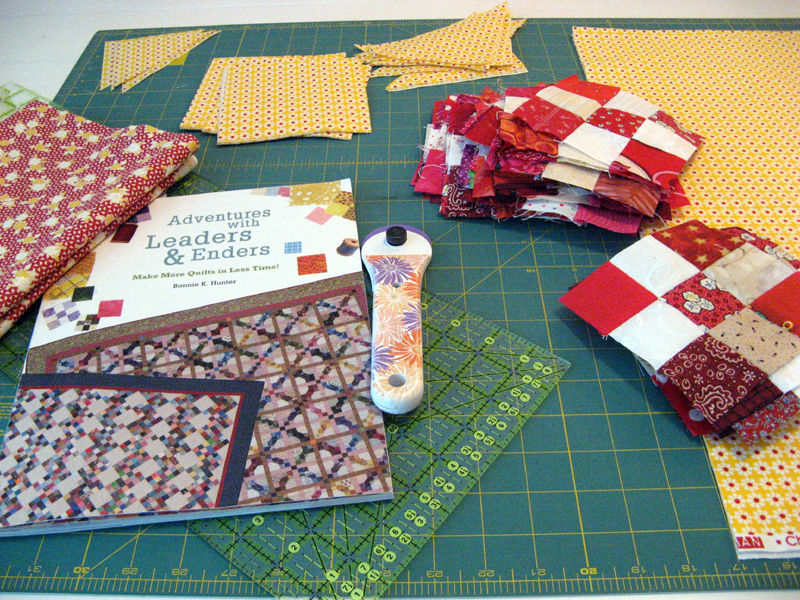 Bonnie Hunter's Sisters Nine Patch is in her book Adventures with Leaders and Enders. 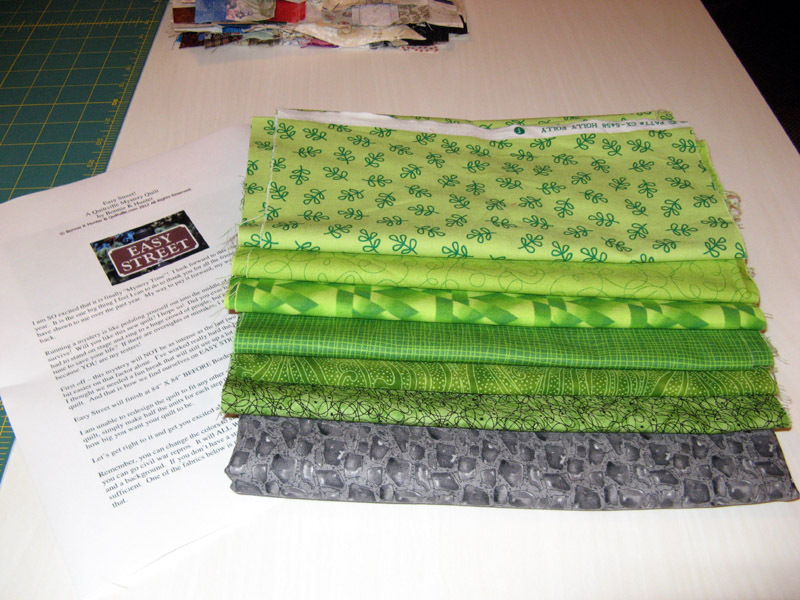 My start with fabrics for Easy Street. 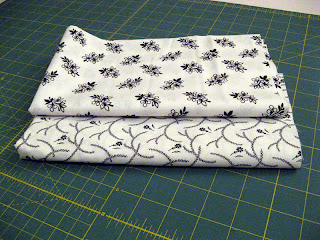 To be honest I'd hoped the first fabric not to use would be the background black on white... Because I'd hoped to pick up a few more "airy" prints over the weekend. I'll get started with what I have...maybe that is a good thing...more coming from the stash instead of directly from my wallet! Our first step released yesterday has us making 4 Patches with the background (black on white) and the constant grey. There is a bunch of them, but it will be easy for me to get this step done before the next clue. If you want to join in on the fun look for the link on the right called Easy Street! Beware these annual mysteries of Bonnie Hunter's are addictive. I got this one done on Wednesday. It is a quiltathon weekend with Judy at Patchwork Times in August this year. My theme fabric is "Golden Books". Do you remember them from your childhood? 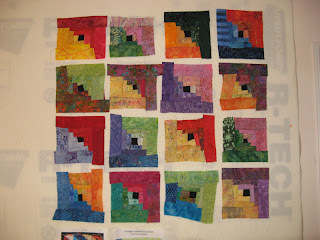 Thursday I finished everything on Karen's Knines. I changed direction on the inner border and went with a black print. I purchased 9 1/4 yards fabric from Quilters Paradise for the back. I'll add it in in Sunday, but take it off too. Sorry to say it will be the last time at Quilters Paradise since they close their store front on today. One heck of a deal on the purchase at $4.50 a yard. I'll sure miss this shop. I'm all set, sewing table is clear...Easy Street is next! I'm nearly done with the top assembly. 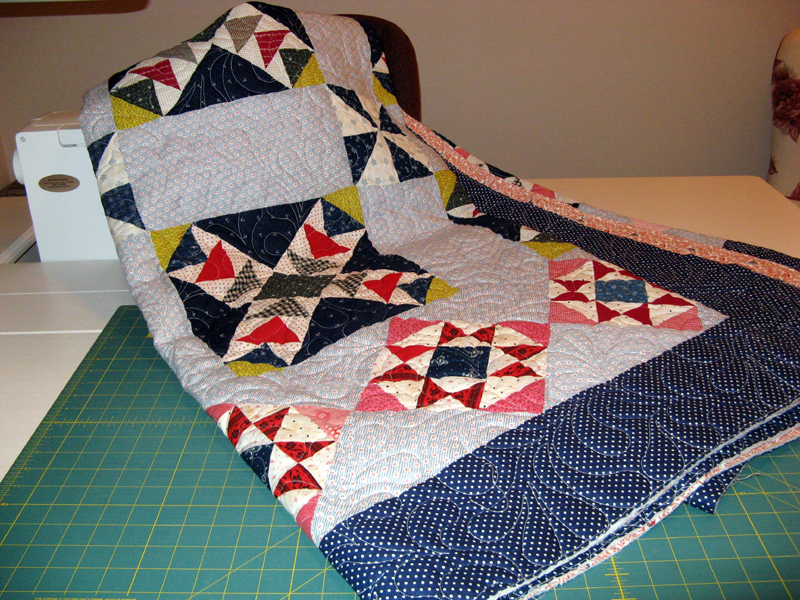 This is one big quilt! 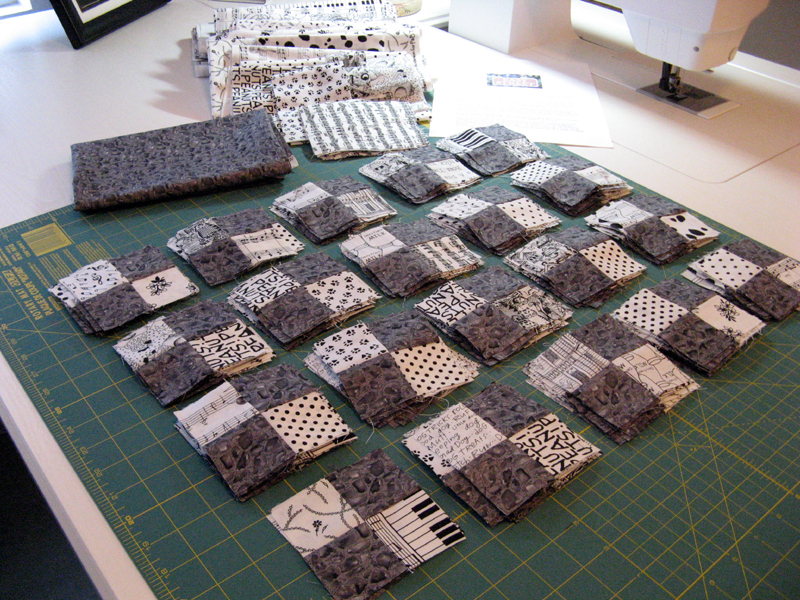 I have all the blocks sewn together into rows. Right now there are five sections that I need to connect. Next will be finding the right inner border. I'm thinking a burgundy would look good. 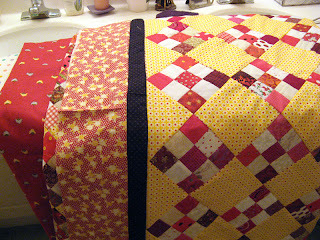 During the football games today I hand sewed down the binding for my Mom's quilt. 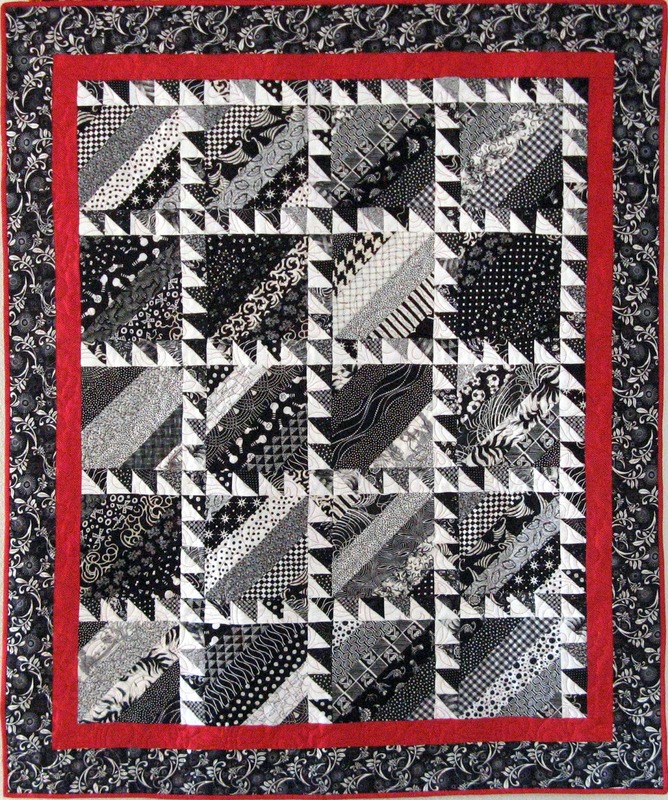 I'm not sure of the name of the pattern, but it is a strip design from Cozy Quilt Shop. A friend found some great "foody" fabrics in good shape at an estate sale recently. She passed them along to me and it worked perfect for this quilt. My Mom plans to donate it to a hospice in Southern Maryland. I am working to have my sewing room ready for Bonnie's Mystery that starts on Friday. I should be in good shape. Tuesday I hope to start pulling all the fabrics from my stash that I think I'll be using. Will you be involved with Easy Street? 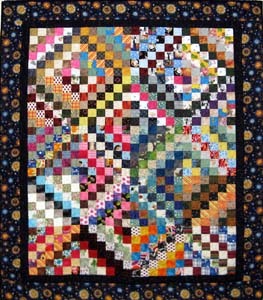 I'll be going to Canyon Quilt Guild Meeting tonight. It is Potluck and Challenge night along with the last meeting of the year. I'll be eating light the first few days of this week making room for the big event on Thursday. Happy Thanksgiving everyone. I do have one finish for this week. 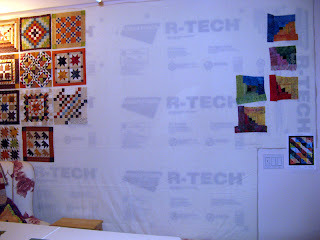 Krayons was started at Road to California Quilt Show in January of this year. I'm so pleased to have it done before the show takes place in 2013! 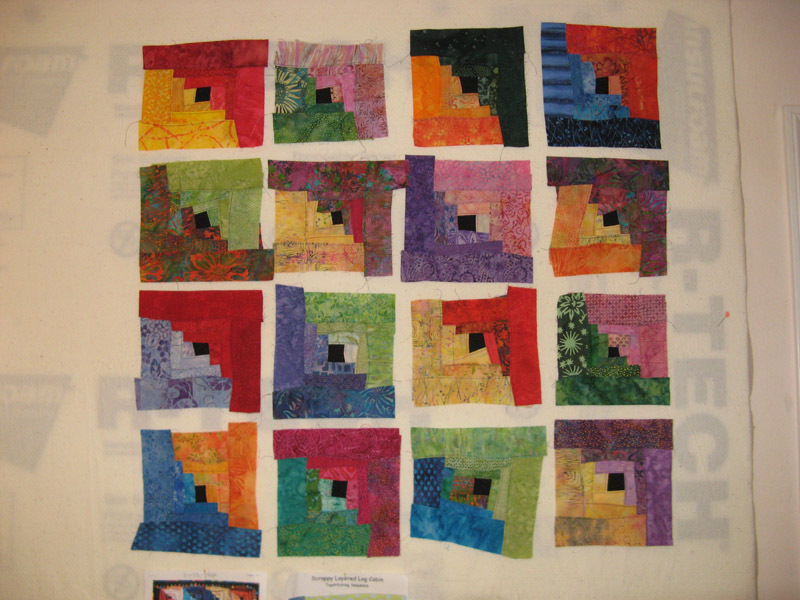 The pattern can be found in Karen Eckmeier's Layered Waves book. It is called Scrappy Layered Log Cabin. I got around to cutting out one of the two projects that I'll need for the next show. The show is to be held the last part of January. This year I'm excited that my Mom will join Kerry and I. Southwest had a great deal recently on flights. I've been wanting my Mom to attend and it worked out perfectly. Anxious to see what the mystery "Expect the Unexpected" will become. The second project that I'm close to finishing is Karen's Knines. 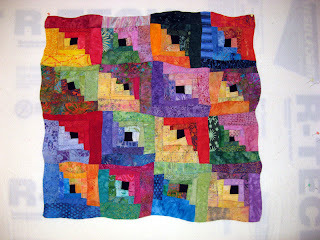 This one is Sister's Nine Patch by Bonnie Hunter. 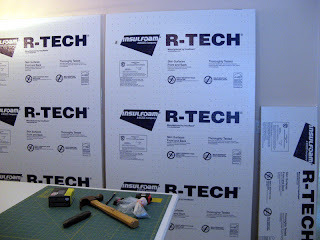 There's more than one way to cover up the "industrial look" of the foam board before I can get the black batting. 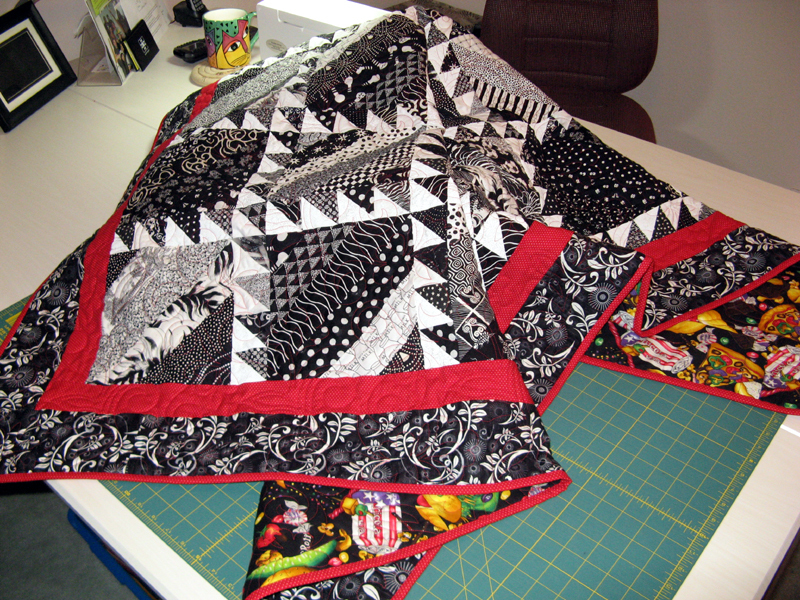 Besides the setting triangles on the right top portion this is the size of the quilt. 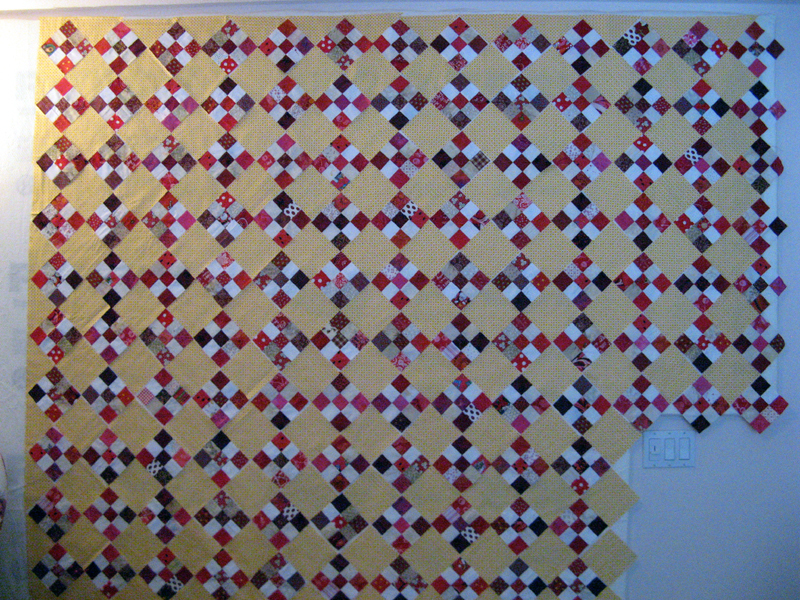 The bottom portion has three more rows yet and the quilt will be square. The design wall ends around the light switch! I'll be sewing the rest of the day putting the blocks and rows together. 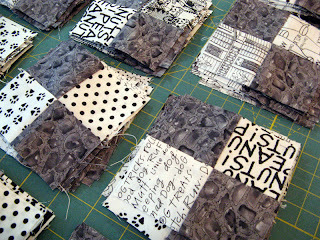 For now I'll report yardage for Krayons. Next week I'll report Karen's Nines. Last night Bonnie Sue turned in her 9" Neutral String Swap blocks. She's just so clever with her delivery. So gracious is Bonnie Sue to include a thanks for coordinating. 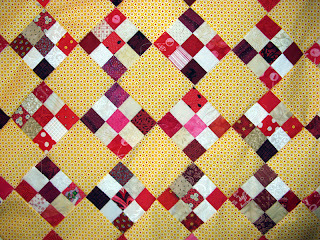 Lovely blocks from Bonnie Sue! Three turned in 16 more to go before the end of January 2013. There is much, much more to put up on the wall, trust me! I wanted to check out if the black batting would cover the "industrial look" of my new design wall. This is taken in the evening. So far so good... Will take a look at it when the sun is up in the morning. Tonight is Sunshine Quilt Guild November Meeting. First we meet to take the speaker, Vikki Pignatelli, out for dinner. Several of us will be dining at El Cajon Brewery. The meeting place is only a couple of miles from there. Vikki will be doing a lecture called Nurture Your Creative Spirit. Her workshop is Crazy About Curves to be held tomorrow. 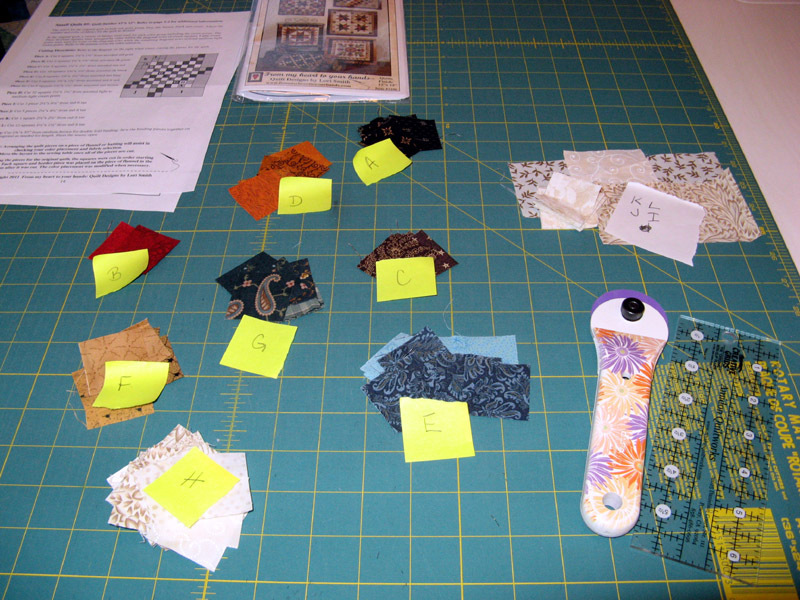 From what I can tell on Vikki's website it looks to be applique curves. Can't take the time from work :(. I'll have to hurry home to catch the double elimination of Dancing With The Stars. It sure is a really good season. Wonder who will go home? 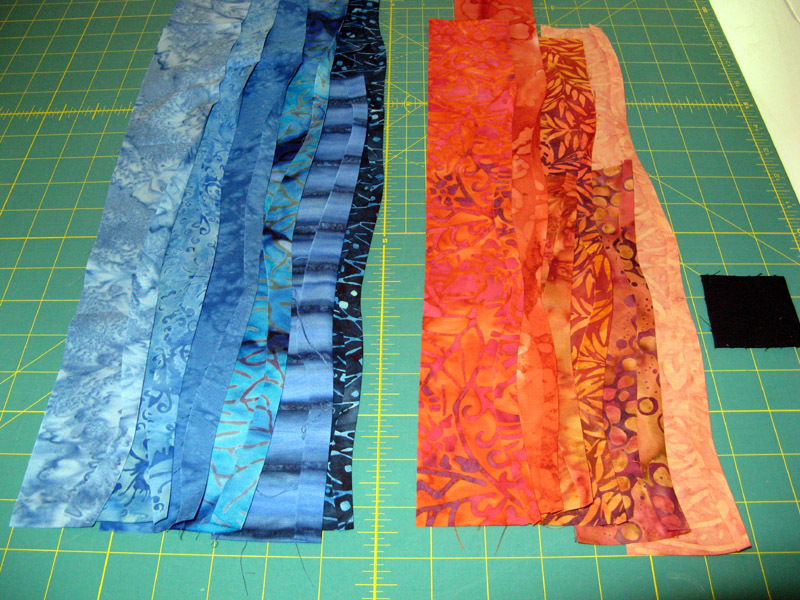 It was a nice day to be sitting inside sewing today. It was bright and clear and COLD...for San Diego that is! 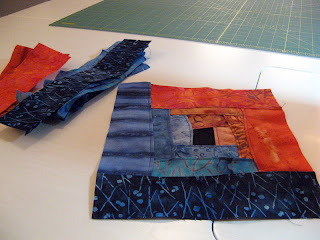 Thought I'd show you how to make a layered log cabin block. 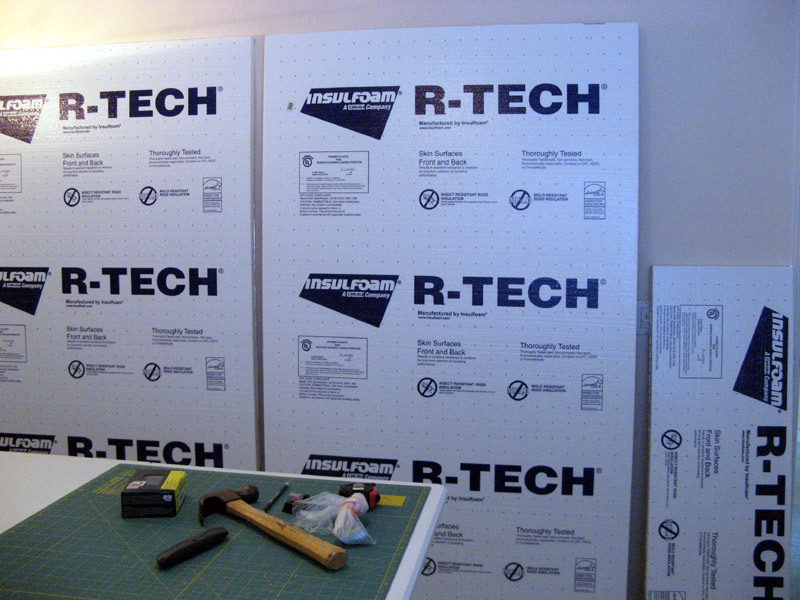 You start with 2 1/2" strips that have the long side pressed down at least 1/4" in a curvy motion. This doesn't sound too easy if you've not done it, but trust me it really is. Next you start building in a counter clockwise direction around a 2 1/2" square with a 1/8" top stitch. 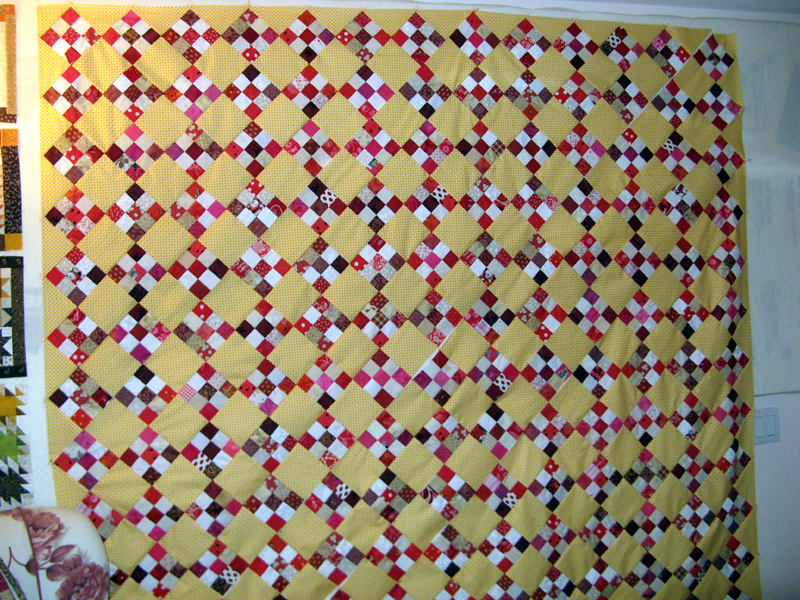 After going around with 12 strips (6 light and 6 dark) you've got a block. There is no particular width of each "log". You just find what looks good to you and go for it. 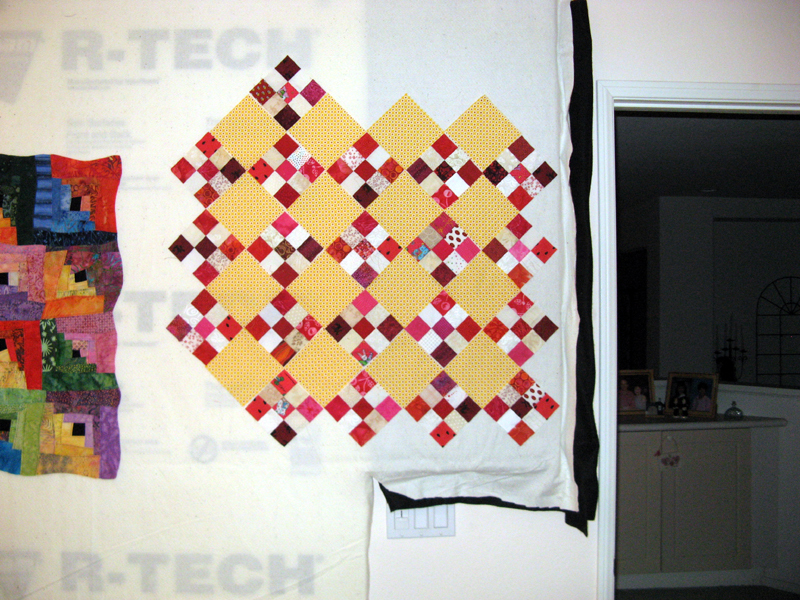 Here's a photo of the finished block front (above) and back (below). Next you arrange the blocks to your liking. I've got mine in a diagonal pattern, but a barn raising pattern looks nice too. Next you layer the blocks in a row on top of each other in the same way as you made the blocks. Pressing under one side, layering over the next block and top stitching it down. 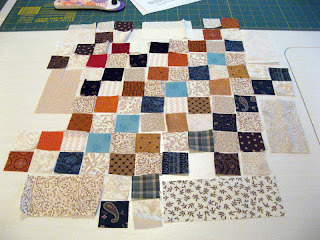 Once you have the blocks sewn into rows you do it all again putting the rows together. 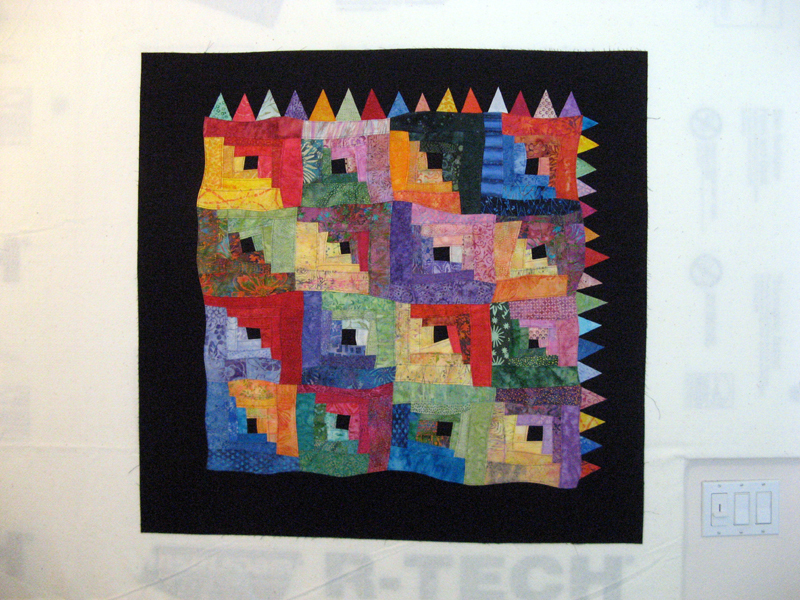 Here's where I am right now adding some fancy triangles on the border with steam a seam. I'll be continuing to press under 1/4" making it curvy and top stitch it down. 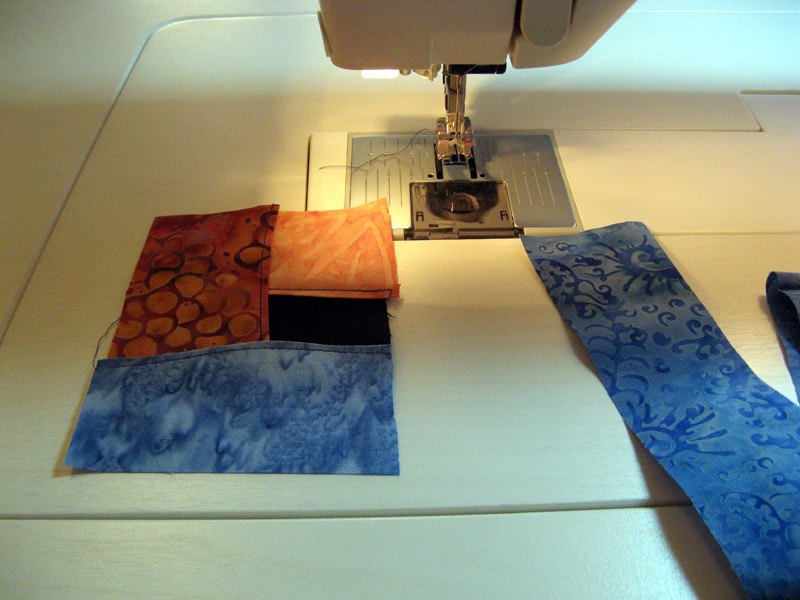 Right border first and sew counter clockwise. Only the right and top will have the triangles. The pattern suggests beads or sequences in the triangles and more triangles on the logs. Not sure beyond what you see how far I'll go with this. 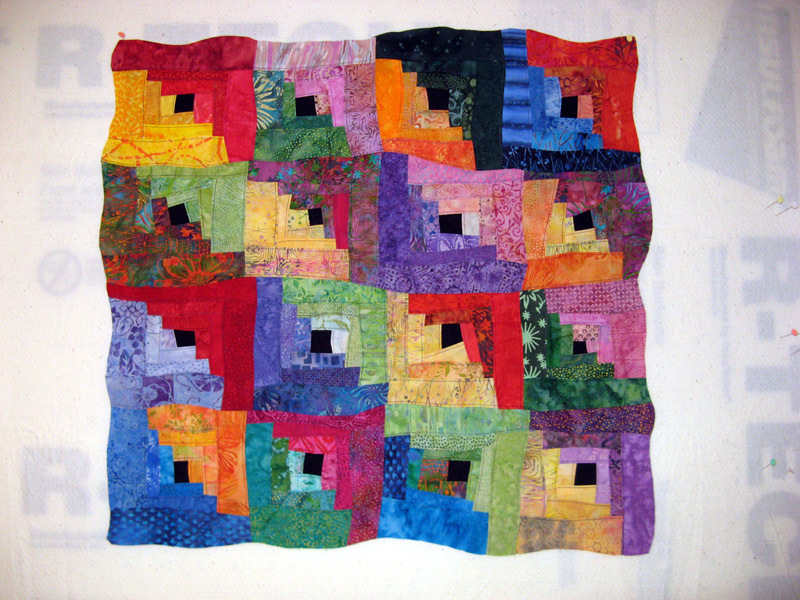 This is a Karen Eckmeier pattern in her Layered Waves book. It's good to have this project nearly done after 11 months from having taken a workshop where I started this project. 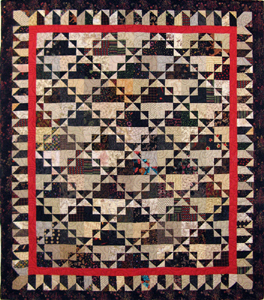 See other quilters displaying their design walls via Patchwork Times. Let's start with a purchase. 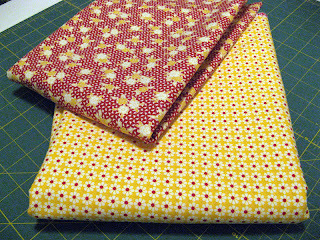 This fabric already has a home with my current project Karen's Knines. I had the 9-patches complete on Thursday. 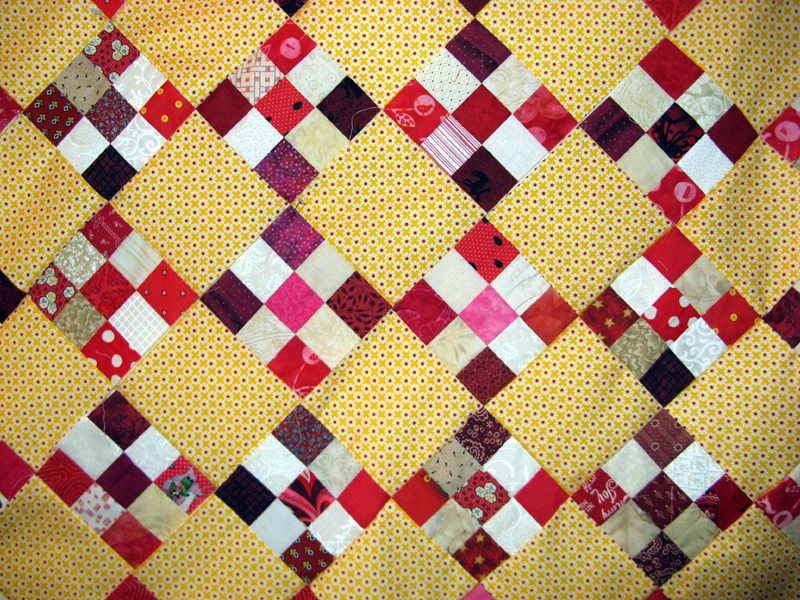 I didn't have a yellow with red that I wanted to use for the setting blocks and triangles as well as the outside border. I went to the new Bits and Pieces along with Paradise Sewing that are both in Poway without success. A drive to Rosie's in La Mesa on Saturday paid off. It was also fun to see friends although I didn't have much time to chat since DH was being ever so patient waiting for me in the car. I'm ready to finish Karen's Knines! It's a Bonnie Hunter pattern in her second book called Sister's Nine Patch. 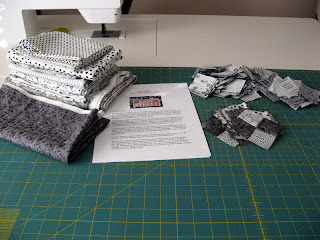 Another purchase at Rosie's was for a couple of black on white that I'll need to beef up my stash a bit for Bonnie Hunter's annual mystery called Easy Street that's set to start on November 23rd. A very happy time for me this week. I've been wanting to put up a design wall for so long. It came to be starting Friday with the purchase of the foam board, nails, washers, and T-pins. 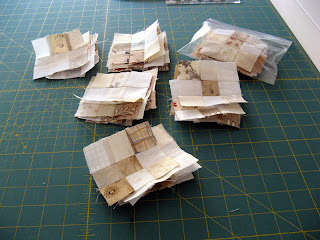 Saturday morning I cut the pieces to size and readied all the tools. DH found all the studs...we measured and double checked that we were right... DH used his might and powered in the nails. He couldn't figure out why I was so elated... 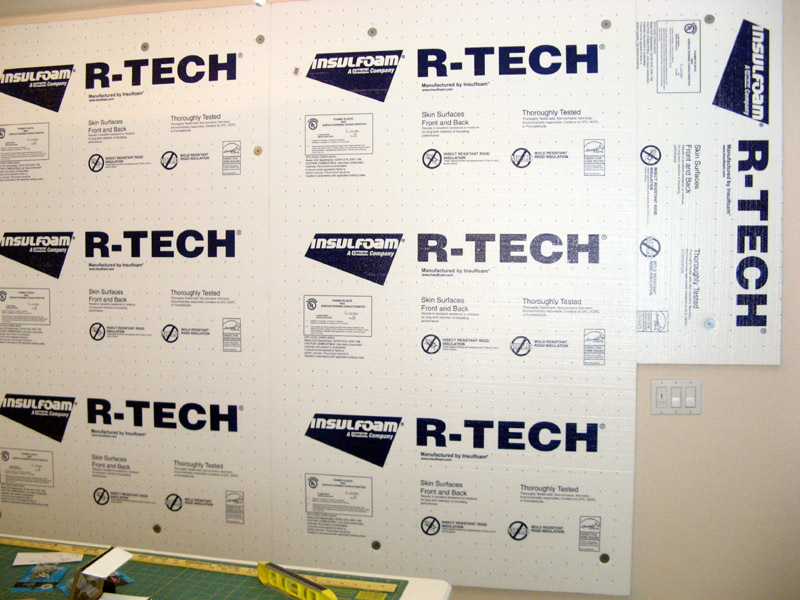 The top of the design wall measures 114" and from ceiling to floor is 78". It stops just above the light switch on the right side and just above the electrical outlet from the floor. 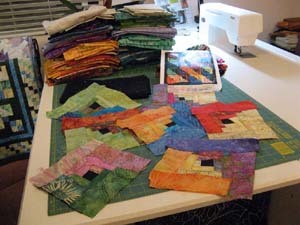 At Rosie's if I spent enough which is not too hard for me to do in a quilt shop :)!...you could get 40% off a notion. Since I needed two king battings, one white and the other black, guess what I used my discount on? Yes, Warm and Natural is considered a notion :)! If they would have had a black it would have come home with me too. 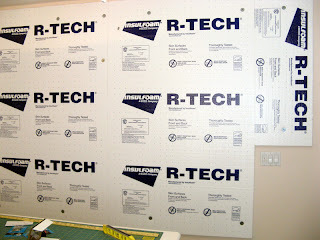 My plan is to put black on the foam board first and then white over top. This way I can cover up the industrial look as DH calls it and have both white and black design walls if the need should present itself. I'll remove a few T-pins and roll the white batting up to the top to expose the black batting. So here's my numbers for this week. Nothing to claim today, but I'm pretty certain I'll have one or two finishes next week. I decided since Bonnie's book Adventures With Leaders and Enders kept going back to Sister's Nine Patch while I was making another of her patterns in the book...that it was meant to be made. I find making 9-patches very relaxing and a bit mindless. 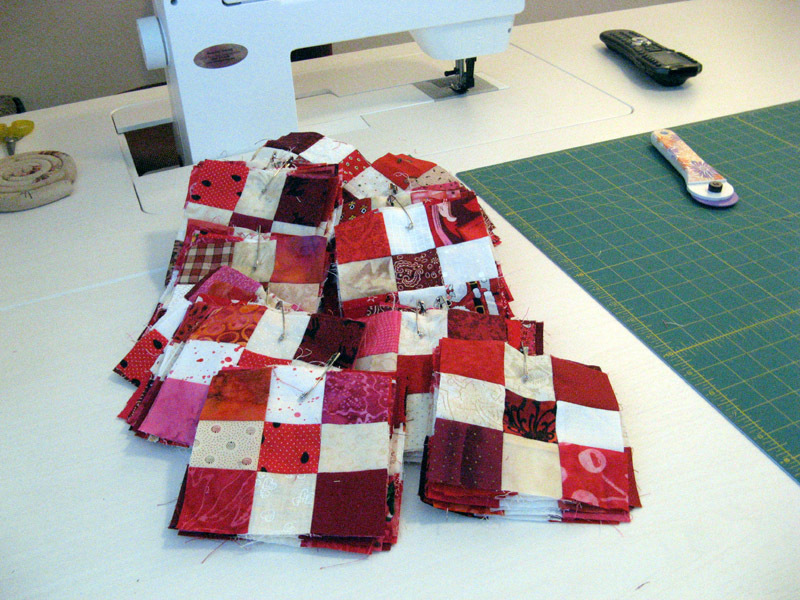 So far all of the 2" squares in various reds and neutrals (yes I changed my mind from using 1 1/2") have come from my scrap bins. After counting I'll be pulling some yardage, but not too much. 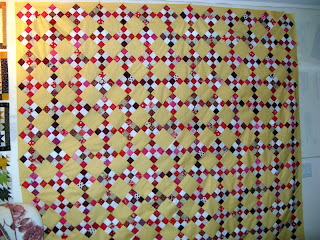 What I will need will be the yellow for the solid blocks. I'm just now starting assembly of the 9-patches. Since my Sister is Karen...what better name than Karen's Knines? 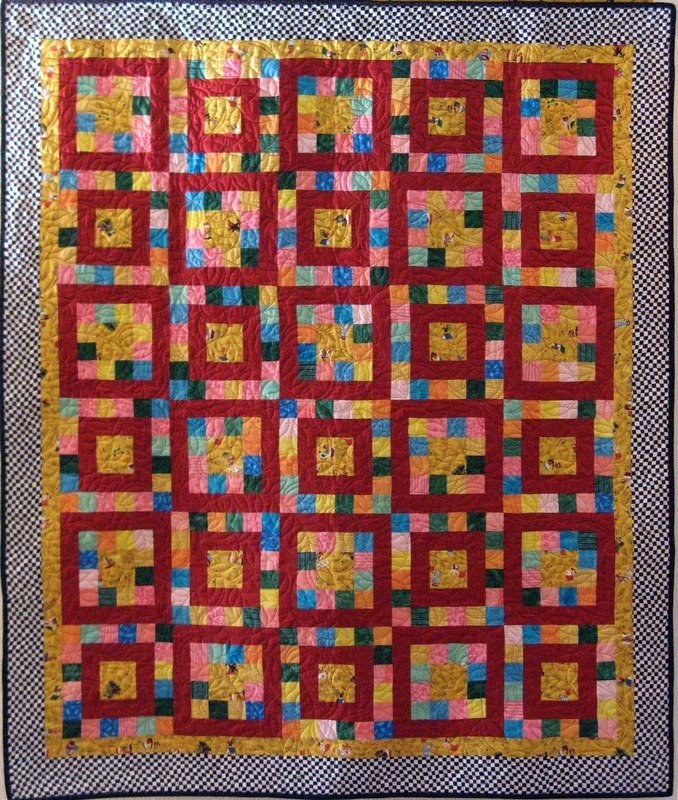 My next trip to a one of my local quilt shops will be looking for the perfect yellow! Has your telephone and mail box been missing anything political lately? Gosh, my phone didn't ring once tonight. Even my mail didn't have any "interesting" fliers included today. Now if those who put up all the signs around town would be so kind to take them away! I'm not holding my breath on that for certain. 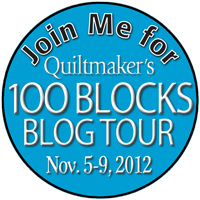 Did you know that the Quiltmaker's Blog Tour is going on all this week? 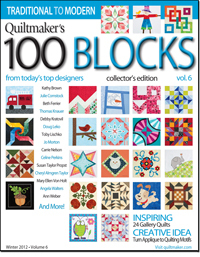 All kinds of fabulous designers show you their block from Volume 6 this week. Here is the link to get you in on all the fun! And don't forget it's Election Day...as if the politicians haven't reminded you enough already with far too many to count telephone calls and mailers! I finished up Krabapple and decided next to finish up a few small projects I had going on. 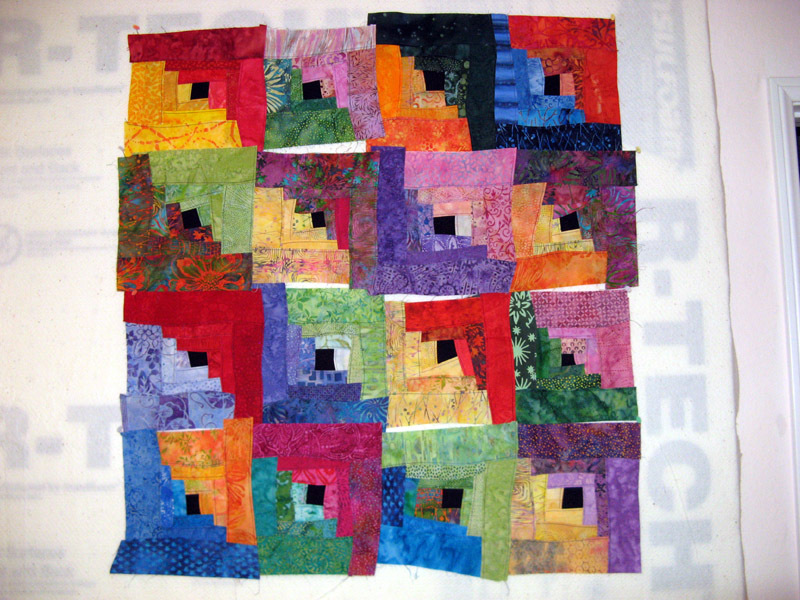 First up the 9-patch neutral blocks. Another 25 were made adding to the others that will at some point be made into a project. Don't know what that will be yet, but I'm sure these will come in handy some day. 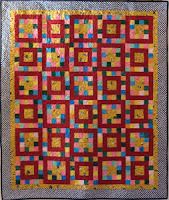 Next up Sunshine Quilt Guild's November BOM. 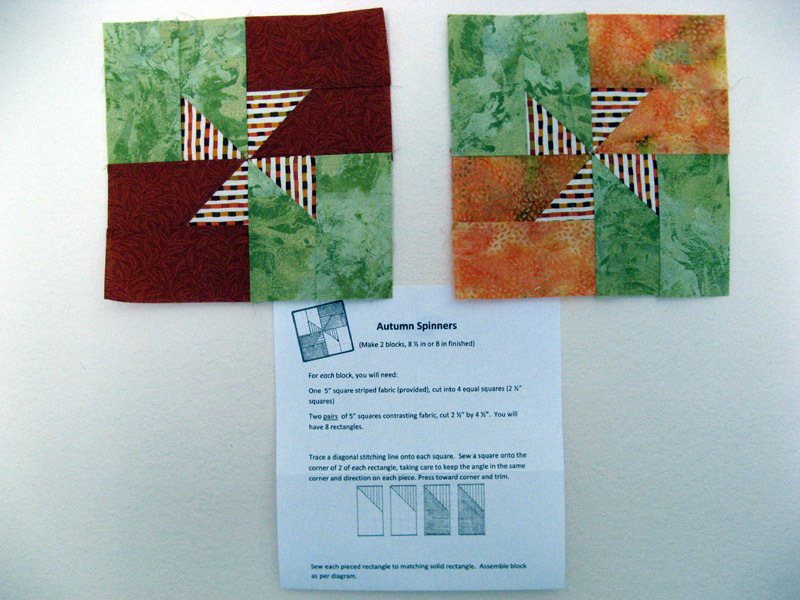 The stripe was provided with instructions to add in two complimentary colors for each block. I really liked how the green with a touch of gold sparkle played with the stripe and the rust and orange looked nice too. I thought about a deep purple, but decided to stay in line with what might be more popular. The deep purple really did look nice. The meeting isn't for another week so I'm early. 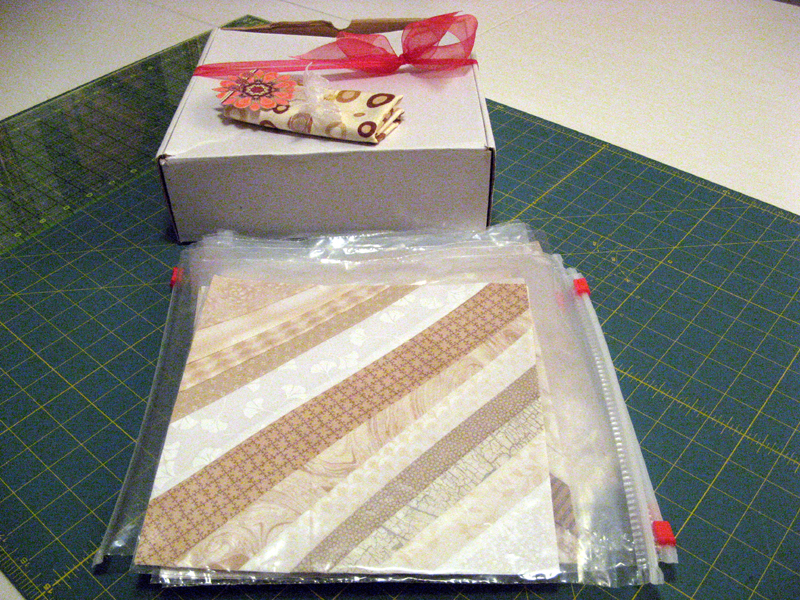 and completed the November Quilt Square Quilt Along block. 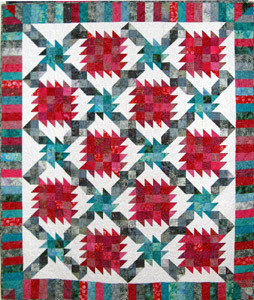 This is a Lori Smith design from her pattern Quilt Squares #6. 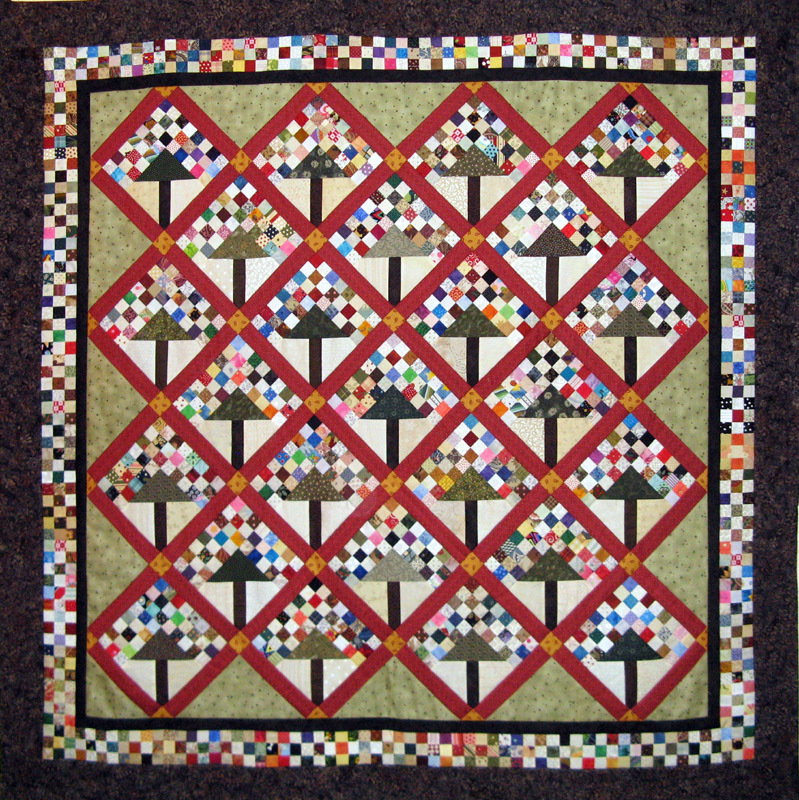 This one is Small Quilt #5. DH said I should make this one over the Single Star design...because it looked so much like the others. This one was more unique; so I went for it! It brings in another light block to match the two already made. 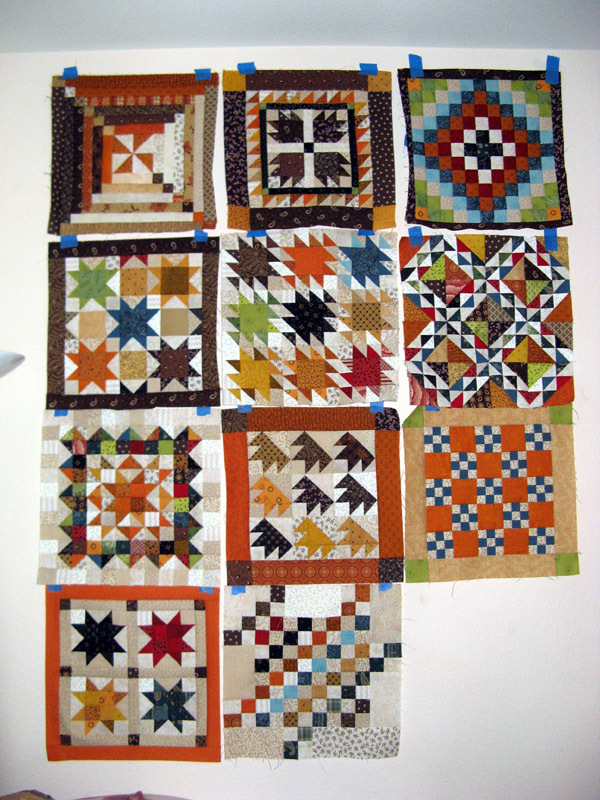 These are the blocks that will eventually be made into a sampler. Only December block to go. Today at lunch I'm pulling from my 1 1/2" stash for anything that will work for Sister's Nine Patch. This pattern is in her Adventures with Leaders and Enders book. 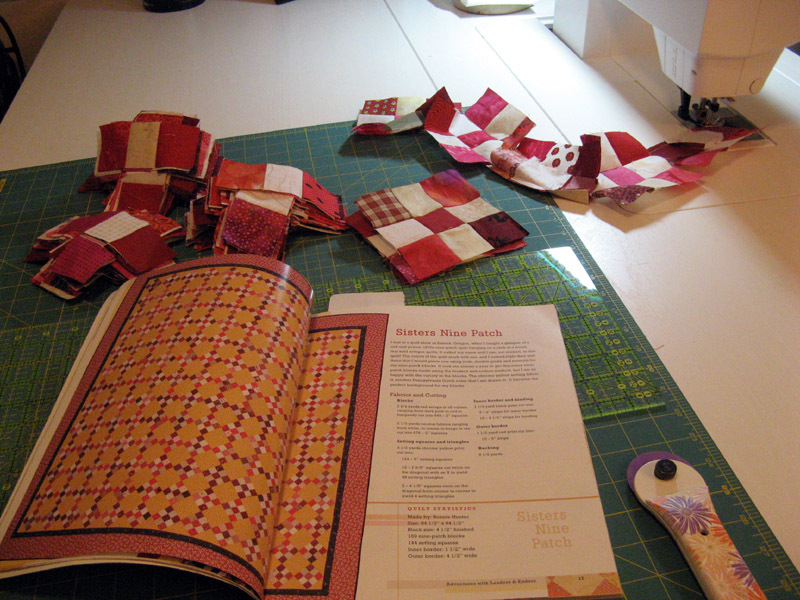 The pages in the book kept flipping to this pattern while I was making Krabapple (Crabapple). There must have been something calling me to make this quilt. I'm going to stay with Bonnie's colors that are reds ranging anywhere from dark pink to red to burgundy and neutrals ranging from white to cream to beige to tan. 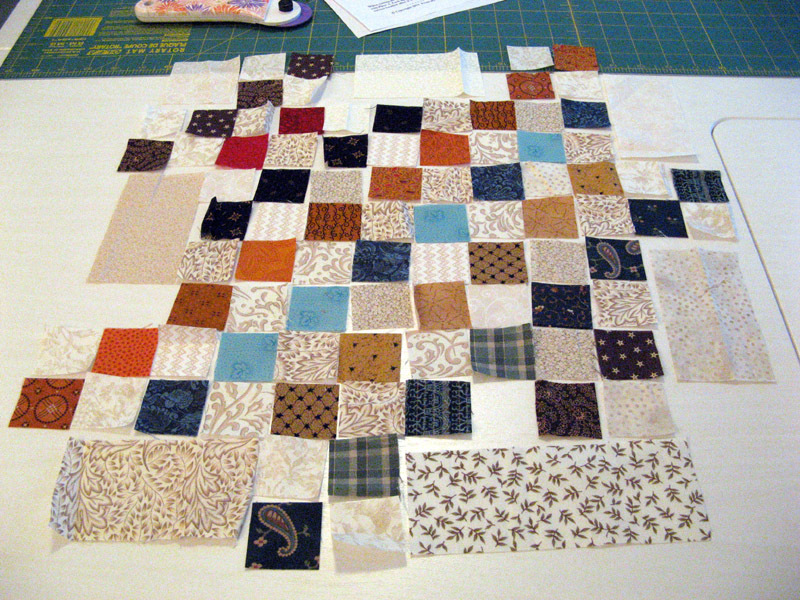 Bonnie's instructions are for 2" squares, but I'm going a 1/2" smaller. More 9-patches coming! I will be getting into another project this week, Krayons. 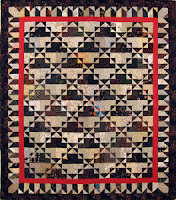 The Scrappy Layered Log Cabin from a workshop I took with Karen Eckmeier in January at Road to California Quilt Show. More on this one as the week progresses. Did you enjoy your extra hour sleep? I have a finish this week! 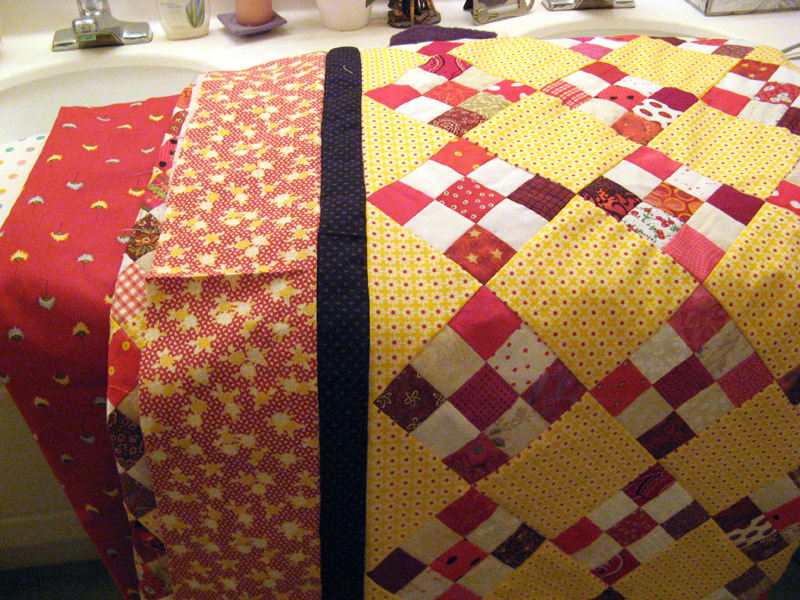 Krabapple is all done and ready to be quilted. 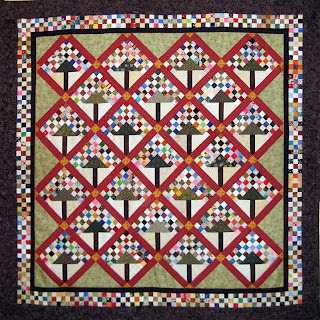 This is a Bonnie Hunter design called Crabapple that is in her book Adventures With Leaders and Enders. 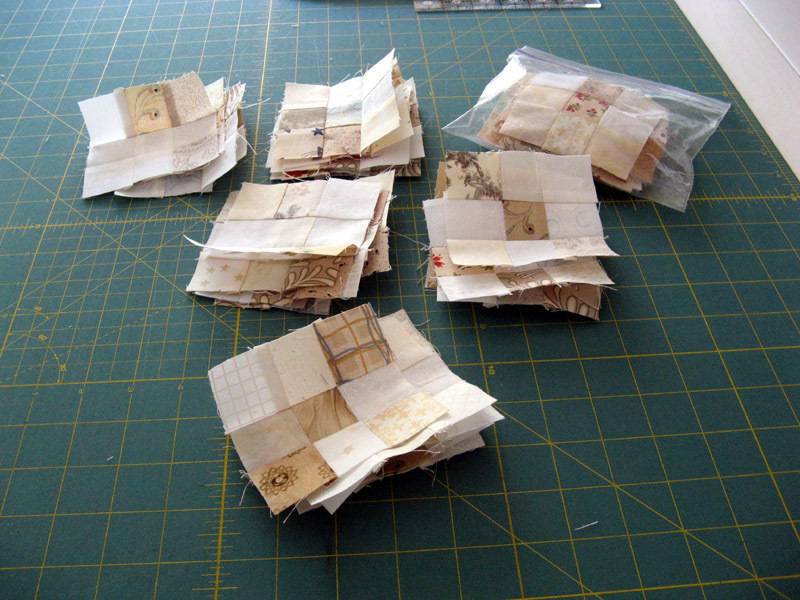 All the 9-Patches were part of a swap with 18 others that I coordinated earlier this year. Next project will be the November small quilt that I'm participating in Jo's Country Junction Quilt Square Quilt Along. 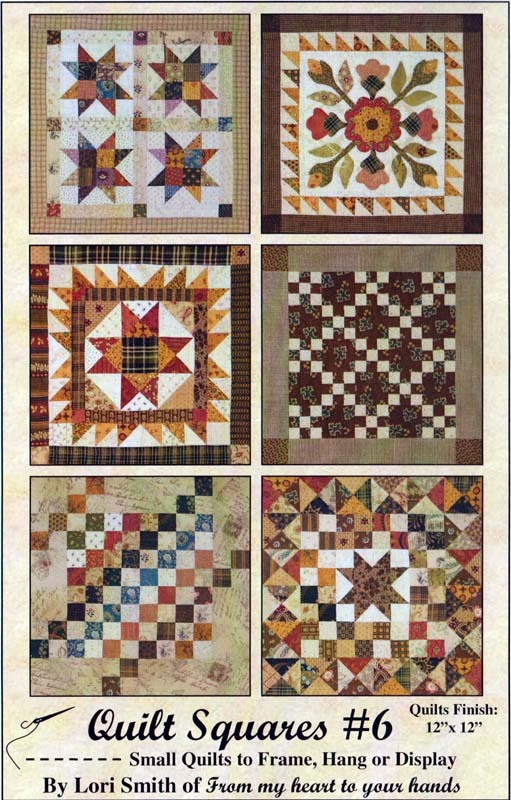 We have our choice of two designs from Lori Smith's Small Quilts #6. I think I'll probably make the Single Star (bottom right). I did add a bit to my stash this week. I purchased 4 yards for Bonnie Hunter's annual mystery Easy Street. 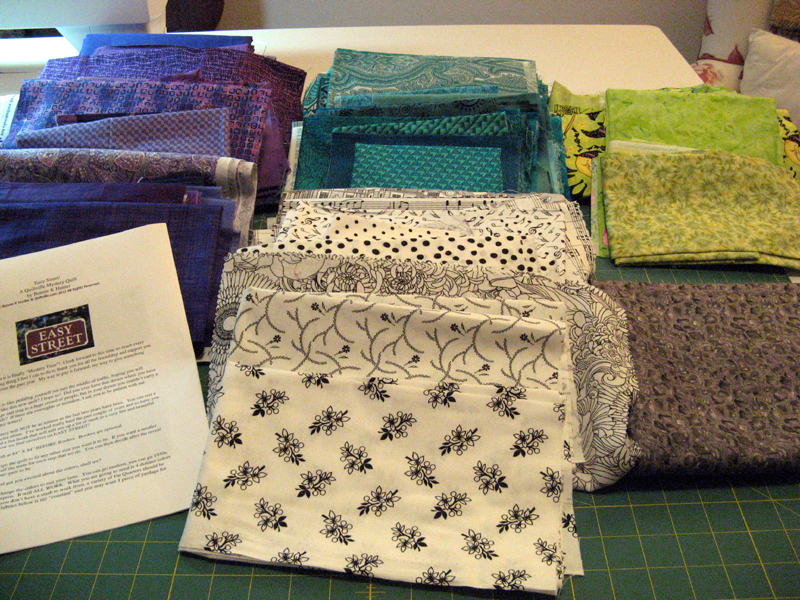 Pretty certain my stash will handle most of the fabric requirements. Easy Street's first clue is released November 23rd. Will you be quilting along too?